Rob Markey (a partner with Bain and global leader of the firm’s Customer Strategy & Marketing practice) provided some very focused and pithy remarks in, of all places, a recent BBC radio show. The context was a discussion that centred on the NHS (National Health Service) and its somewhat controversial Friends and Family Metric. In the interview Rob made some points that apply for customer feedback and closed loop processes of all kinds. ….the [Enterprise Rent-a-Car] leadership team there said “listen, you change your organization with clarity and simplicity”. Clarity and simplicity: we seem in most organisations to be driving for more and more complexity. Here is an organisation deliberately going the other way; looking instead for the few important things that need focus. The underlying cause of this drive for complexity is, I would argue, the drive for more accuracy. The desire to be exactly right before making a decision – This is a misplaced focus. At a certain point being more accurate does not provide any additional value and becomes worthless or even counterproductive. If you leap out of a plane and your parachute fails to open, knowing exactly how fast you are falling is irrelevant. Your focus should be completely on how to open that reserve chute. So it’s not actually the score itself, but it’s how they were using it. In reality there is no objective, absolute, measure of customer satisfaction or Net Promoter Score® for that matter. The number and variety of skewing factors for every such measurement are so many and so varied, as to make the idea impossible. The focus of your efforts should be how to use the score, and process, to change your organisation. And that is, they were taking the feedback from individual customers and delivering it right away to the employees who needed to hear it. Transparency, transparency, transparency: get the information to the people that can understand and act on it. Don’t hide information from staff in the misplaced fear that they will not be able to understand or act on it. Any customer metric can be gained. The key is to create a metric and a system that people in your organization view as beneficial to learn from. Yes sad but true, a small proportion of your workforce will try to game the system. This is a fact of life. If you reward something then people will try to make it happen. Mostly honestly and fairly but there will always be some grey area and there will always by a few that will take it further. Make the process as open and beyond reproach as possible but at the same time make the rules for the 97% of people that do the right thing not the 3% that do the wrong thing. Help the 97% of people to use the metric to improve the business. The Net Promoter System is a lever for cultural change. The whole point of it is to create culture change. At the end of the day the role of Net Promoter®, or indeed any well implemented closed loop customer feedback process, is to change the culture of the organisation. 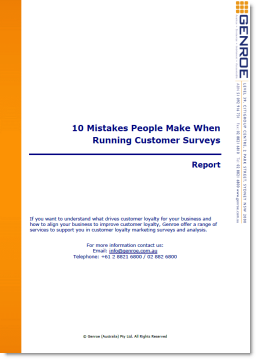 The goal is not to create a theoretically and statistically perfect measure of customer loyalty. That is essentially impossible and worthless. Use these approaches to put the customer at the centre of your organisation. If you focus on the customer and support your staff in that focus, the shareholder returns will follow.